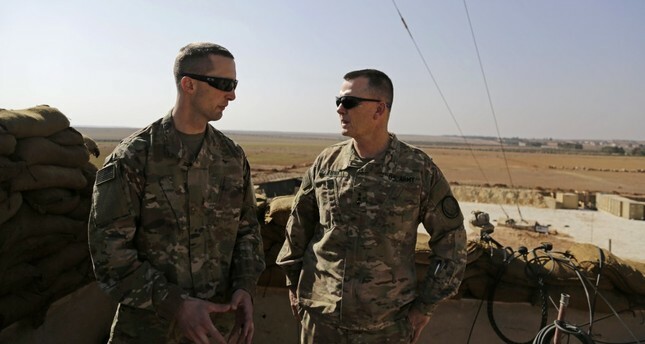 Two members of the U.S. Army at an American outpost in Manbij as part of Washington's support of PKK-linked Syrian nonstate groups, Syria, Feb. 7. The United States' recent announcement regarding three PKK executive members has hit headlines both in Turkey and the Middle East. Concerns surround the possible reasons why the U.S. made the move that is certain to lead to issues for Turkey, neighboring countries and Kurdish people. The million-dollar question is whether the decision is conjectural or a politically calculated move. In fact, experts and journalists who closely follow regional developments were not surprised as U.S. Secretary of Defense James Mattis had hinted at the move last February. "We [the U.S.] can make the YPG [People's Protection Units] fight against the PKK," said Mattis. His words had another message, the U.S. is going to be a permanent actor in Syria – and so it is. Presidential Spokesperson İbrahim Kalın replied to the U.S. decision: "Despite being positive, it is too late and a tactical attempt." Kalın also highlighted that the problem is clearly that the U.S. does not recognize the YPG/Democratic Union Party (PYD) as a terrorist organization. No matter what, the Turkish side cannot accept this stance under any circumstances. It is not that hard to understand that the Daesh issue is just a pretext for the U.S. to remain active in Syria and the region in general. That's why it is now trying to make a distinction between the PKK and its Syrian offshoots and to present the YPG/PYD as a legal group in the eyes of the whole world while planning to remove the legal basis for Turkey to intervene in the area east of the Euphrates. That is one side of the issue. The other side is the U.S.' efforts to fix its problems with Turkey. However, by doing so, the U.S. administration is taking dangerous steps that will have huge impacts on each regional party and even change alliances. The consequences of the U.S.' actions will become clearer in the future; however, the decision will primarily impact the PKK-PYD bloc and Kurdish sociology. This may even mark a milestone for them soon. It is noteworthy that the U.S. is well-known for its broken partnerships and agreements with regional actors, and its broken friendships have always become a burden not for the U.S. but for the other parties. Therefore, the last thing any player in the region should do is trust the U.S. Today, the PKK-linked Syrian terrorist groups are now seeing the true character of the U.S.